Brixton, near Plymouth, Devon—acting for Brixton Parish Council, opposed to a major residential development on a green field site outside the built up area boundary. Refused planning permission by South Hams DC, now listed for a public inquiry in October 2018. I shall be representing the PC at the inquiry having successfully obtained Rule 6 status. Issues include sustainability, traffic and transport impacts and housing land supply. Dorset Minerals Plan—due to go to an Examination-in Public summer 2018, I continue to act for both the local Parish Council and FRAME in opposing a number of proposed sites near Moreton and Woodsford. Straitgate, Ottery St Mary, Devon—the long running planning application to develop Straitgate for sand and gravel extraction continues. For more information see Straigate Action Group. Watergate/Lanherne, Cornwall—advising on opposition to the proposed expansion of a holiday park in an Area of Great Landscape Value (AGLV). An application for permission to judicially review the decision of Cornwall Council to grant planning permission has now been submitted. Ilford, Redbridge—advising and assisting Ilford NOISE, a group of local residents opposed to a major urban redevelopment scheme in the centre of Ilford. Main issues concern lack of affordable housing, sustainability traffic and transport. For more information see Ilford Noise. See also Guardian 23 March 2018. St Dennis, Cornwall—advising and assisting the local branch of the Cornwall Waste Forum in relation to numerous complaints over the operation of the SUEZ Incinerator (the Cornwall Energy Recovery Centre–CERC). Matters include statutory nuisance, HGV traffic and operational problems. Colyton, Devon—successfully opposed a proposal to extend a holiday/tourism development within an AONB. Issues included accessibility of new development, tourism policies, landscape impacts. Broadclyst, Devon—enforcement of planning conditions arising from a pig fattening unit and adverse impacts on neighbouring properties. Culm Valley Garden Village and emerging Mid-Devon Local Plan—advising and assisting local residents and Parish Council opposed to the proposed allocation of land east of Cullompton, Devon for up to 5,000 new homes on a green field site. Major concerns include flooding, infrastructure and housing need. For more information see Residents Against Cullompton Exploitation (RACE). Snowdonia National Park—advising and assisting the Snowdonia Society (Cymdeithas Eryri) opposed to a proposal to construct a 5MW hydro-electric scheme near Betws y Coed. For more information see Snowdonia Soceity. West Berkshire Waste and Mineral Plan—acting for local residents opposed to the proposed allocation of a site in the North Wessex Downs AONB for sand and gravel extraction. Matters of concern include Sustainability Appraisal (SA), Habitats Regulations Assessment (HRA) and Landscape and Visual Impact Assessment (LVIA). 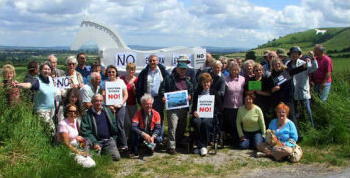 Photo: Campaigners against the Westbury bypass successfully defeated their road scheme in 2009. Photo by kind permission of the White Horse Alliance. Feniton housing developments. Appeal by Feniton Park Ltd et al for housing developments in East Devon. I represented Feniton Parish Council, for whom I prepared an inquiry opening statement arguing that "these proposed developments are not sustainable, they will not positively improve the quality of peoples' lives or that of the natural environment, and will not perform a positive economic, social or environmental role". The planning inspector dismissed the appeals on 7 April 2014. Read the decision letter (PDF) and the reaction from Councillor Claire Wright and the East Devon Alliance. Devon pig farm. A controversial appeal to build a huge industrial pig unit in an area of outstanding natural beauty at Higher Metcombe has been dismissed by a planning inspector. I helped local residents in drafting their written submissions for the appeal. Whitecleaves Quarry, Buckfastleigh. Proposal to store and process incinerator bottom ash (IBA). Application refused and appealed, planning inquiry held in June and July 2013. I represented Buckfastleigh Community Forum (also on Facebook), and presented "overwhelming reasons" for dismissing the appeal in a detailed closing statement. The appeal was refused on October 17, 2013 on the grounds that the plan would not "deliver sustainable waste management", would do "likely harm to biodiversity", and would "conflict with waste policy". Read the decision letter and the rejection of the applicant's costs award. Pinewood Studios, Iver Heath Bucks. Appeal by Pinewood Studios Ltd (2010-2011) against a refusal by South Bucks District Council for planning permission to build a "new model community for the creative industries for the 21st Century". I acted for Stop Project Pinewood, an alliance of local residents and the Parish Councils of Denham, Iver and Fulmer (representing a total population of c17,000 people). The scheme involves the construction of 15 permanent "streetscapes" for filming, and 1,400 dwellings in the Metropolitan Green Belt. Issues raised covered loss of over 100 acres of Green Belt land, traffic and sustainable transport, and local amenity. In January 2012, the Department for Communities and Local Government (DCLG) rejected the appeal because "the proposal would amount to urban sprawl of the type the Green Belt is seeking to contain". Unfortunately, the controversial £200 million Pinewood Studios expansion plan was later given the go-ahead after a further planning appeal. Read the decision letter and inspector's report (PDF). Stonehenge Farm, Northmoor, W Oxon. Appeal by Hanson Aggregates 2009-2010: This appeal involved a proposal to quarry almost 2 million tonnes of sand and gravel over a 10 year period from 100 acres of floodplain in West Oxfordshire. I represented the Oxfordshire Upper Thames Residents Against Gravel Extraction (OUTRAGE) at the Inquiry. Major issues included flood risk, landscape impacts, biodiversity losses, traffic impacts and local amenity. Innis Downs, Bodmin A30 Trunk Road Service Area. Appeal by Land Planning Group LP 2009: A planning proposal to build a Trunk Road Service Area (TRSA) including a petrol station, 100 bedroom hotel, tourist information centre and restaurant on a green-field site adjoining the A30 and A391 in Cornwall. I represented a group of local residents, Protest Against Innis Downs (PAID), who were concerned about adverse impacts on landscape, light and noise pollution, impact on the local economy, and on a Scheduled Ancient Monument (SAM). The proposal was refused on appeal. For further information see Inspector's Report, Appeal Reference: APP/D0840/A/08/2089350. Pantmawr Inn, Cardiff. Appeal by Mitchells & Butlers 2008: A proposal by Mitchells & Butlers and Charles Church Wales to demolish the Pantmawr Inn, Tyla Teg, Cardiff and replace the pub with 36 dwellings. I represented the Pantmawr Action Group who were particularly concerned about the loss of the pub as a valued community facility. The Inspector found in our favour (see Inspector's Report, Appeal Reference: APP/Z6815/A/08/2075016). The pub has now been taken over by the community and is being successfully run as a community pub. A350 Westbury By-Pass, Wilts. Call-in Inquiry. 2008: A major, and highly controversial proposal by Wiltshire Council to construct a by-pass to the east of Westbury through the Wellhead Valley. Major issues involved landscape and biodiversity impacts, traffic, regeneration and climate change. I represented the White Horse Alliance (WHA), an alliance of environmental organisations which included Friends of the Earth, CPRE, and the Campaign for Better Transport. In one of the only call-in inquiries which has found against a major road scheme, we were successful in persuading the Inspectors to refuse the planning application, the Side Roads Order and the Compulsory Purchase Order. For further information see the A36 Corridor Alliance website and the Inspector's Report reference APP/K3930/V/07/1201863. 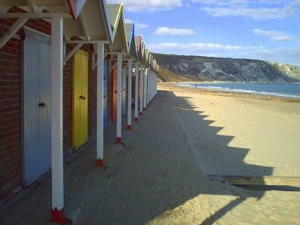 Weymouth Relief Road Dorset. CPO Inquiry. 2007-08. Brighton and Hove Albion FC, Falmer Stadium. Call-in Inquiry. 2003-07. Arsenal FC Stadium. CPO Inquiry 2003. 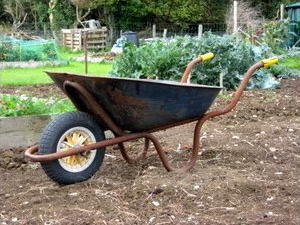 Eastleigh Allotments, Hants. S8 Allotment Act Disposal Inquiry 2006. The Triangle, Romsey, Hants. Appeal by Viridor Waste Management. 2002. Barnstaple Western Bypass and Bridge. CPO Inquiry. June 2001. Case study. Kenyon Junction Public Inquiry February 2000. Case study. Portobello Sewage Treatment Works Brighton. Appeal by Southern Water. October 1999-February 2000. Case study. WBB ball clay quarry extension and diversion of two rivers, Teigngrace, Devon. Call-in Inquiry, July-September 1998. Case study. Photo: I've helped a number of allotment societies to resist development schemes. M4 CEM Programme, Gwent—Strategic Environmental Assessment (SEA). East Devon District Council—Local Plan representations for Examination in Public (EiP). Wiltshire Council—Local Plan for Examination in Public (EiP). M6 Link Road—Infrastructure Planning Commission. Impact on European Protected Species. Planning application—Centre for Agricultural Bioscience International (CABI), major housing development in South Oxfordshire AONB. Planning application—Housing development, the Knowle, Sidmouth. Planning application—Housing and ancillary development (golf club house), Torbay, impacting on South Hams SAC (Greater Horseshoe bats) and AONB. Public Inquiry—Exminster. Housing development, greenfield site adjoining SAC and SPA. Planning application—housing development Tipton St John, Devon. Planning application—Energy from Waste (EfW) plant, Devonport, Plymouth. Planning application—Hinkley Point, EDF application for site clearance for replacement nuclear power station. Ardley, Oxon. Viridor Energy from Waste Incinerator. Appeal Inquiry 2010. SITA Energy from Waste, St Denis Cornwall. Appeal Inquiry 2009-10. Kirkby, Lancs. Tesco and Everton FC Appeal Inquiry 2009. Lancaster Centros urban regeneration scheme. Call-in Inquiry 2009. Aberdeen Western Peripheral Route Inquiry 2008-09. Heysham Lancs. M6 Link Road Inquiry 2007. A27 Southerham, Sussex. CPO Inquiry 2005. Sidlesham, Hants. Appeal by Airwave MMO2. 2004. Linslade, Bucks By-Pass Inquiry 2003. Sidmouth, Devon—East Devon District Council has now refused permission for an application to develop a business park at Two Bridges Road, Sidford. I advised objectors and assisted in drafting objections opposed to this major development in an AONB. Even though the site was allocated for development in the new Local Plan, the application conflicted with a broad swathe of plan strategies and policies. Wrington, North Somerset—acting for local residents, opposed to a proposal to build up to 56 houses on a greenfield site, outside the village boundary in a highly unsustainable location. Adverse impacts on landscape, ecology and amenity. Corsham, Wilts—acting for local residents' association, the Pickwick Association, opposed to a series of major residential developments with potential adverse impacts of the Bath and Bradford Bats Special Area of Conservation (SAC). Clyro, Powys—proposal to construct two poultry units housing up to 23,500 hens. Advising local residents on objections. Issues include potential water pollution of the River Wye SAC, fugitive ammonia emissions, and adverse visual impacts. Winchester, Hants—advising the owner of a trout fishery on the River Itchen on matters relating to discharge consents, abstraction licences, negotiating with the EA. Wallingford, Oxon—acting for local residents opposed to a proposal by the Centre for Agriculture and Bioscience International (CABI) to build up to 91 houses in an Area of Outstanding Natural Beauty (AONB). Despite the Officer recommending approval of the scheme on the grounds of exceptional circumstances, the Planning Committee of South Oxfordshire District Council were persuaded to refuse the application in June 2016. Bideford, Devon—advising a local group for a public inquiry into the refusal by North Devon District Council to allow a major housing development to proceed. Issues involve biodiversity losses and offsetting. Dorset Minerals Plan—advising local residents in the Woodsford-Moreton area on the proposed inclusion of sites for limestone quarrying in the emerging Dorset Minerals Plan. Also opposing planning applications for the extension of existing quarries in the area. Devon Minerals Plan—advising local residents for the Examination in Public (EiP) which took place in May 2016. 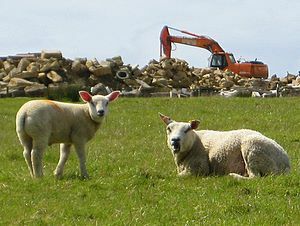 Also opposing planning applications by Aggregate Industries to quarry for sand and gravel at Straitgate Farm and extend the life of the processing plant at Blackhill in the AONB. For further information see Strait Gate Action Group. Clyst St Mary, Exeter—acting for Bishops Clyst Parish Council and Save Clyst St Mary residents' group opposed to a proposal for mixed use development at Winslade Park by Friends Life involving Listed Building Consents and the construction of up to 217 dwellings. The applications were refused in May 2016. Reasons for refusal include adverse impacts on landscape and character, adverse impacts on the social cohesion of the village, failure to mitigate against residential impacts on the nearby SACs, as well as heritage issues and flood risk. For further information see Save Clyst St Mary. Barnstaple, Devon—advising a local group on a series of planning applications which, in total amount to over 440 dwellings on greenfield sites in Pilton, North Devon. For further information see Pilton Residents' Group. Dartington, Devon—advising a local group, Don't Bury Dartington, on the disposal of land owned by the Dartington Trust to a housing association for development. A grant of planning permission by South Hams District Council has been challenged in the High Court, a full hearing due in July 2016. For more information see Don't Bury Dartington. Hawkeridge Business Park, Westbury, Wilts: Acted for Hawkeridge Action Group (HAG), opposed to the creation of a 14.3ha Business Park on greenfield agricultural land outside Westbury Wilts. More information from Hawkeridge Action Group. Honiton housing, Devon: Acted for Gittisham Parish Council opposing planning application for up to 300 houses on a greenfield site outside the built up area. Planning approval granted on the casting vote of the Committee chairperson. West Way, Botley Oxford: A multi-million pound redevelopment proposal involving the demolition of existing shops and homes to be replaced by a major mixed-use development including retail, offices, student accommodation, a hotel and cinema complex. I assisted the local community organisation, West Way Community Concern, on planning issues. Despite being recommended by officers for approval, the Planning Committee of the Vale of the White Horse DC refused the application by a 13-0 majority. For more information go to Westway Concern. Herefordshire Local Plan: Advising Here For Hereford on the proposed link road around Hereford and other aspects of proposed spatial policies in the emerging Local Plan. The Examination in Public commenced in Feb 2015. More details about the Herefordshire Local Plan. East Devon Local Plan: Acting for (Save our Sidmouth), advising local community group on spatial planning policies set out in the emerging Local Plan for East Devon. Represented the group at the Examination in Public hearings Feb–March 2014. Plan rejected by the Inspector, now awaiting up to date housing figures for the plan period. Sidmouth solar farm: I wrote a formal objection [PDF] for the Sid Vale Association, a charity concerned with the preservation of the Sid Valley, who opposed the construction of a 33,220-panel solar farm in the East Devon AONB. The plan was rejected by Sidmouth town councillors in September 2013. Stop Hinckley. Opposed to the development of a replacement nuclear power station at Hinkley Point on the Bristol Channel. Planning permission is pending for a preliminary site. Cloakham Lawns, Axminster, Devon. 2011. Proposal to build 400 dwellings on greenfield site. Advice on judicial review for Save our Parkland (local residents group) and Axminster Town Council. The High Court has granted permission for this to go to a full hearing. Sentry's Farm, Exminster, Devon. 2011. Proposal by Bellway Homes to build 65 homes on a greenfield site adjacent to the Exe Estuary Special Area of Conservation (SAC). Objection lodged on behalf of local residents group Get Involved Exminster. The application was refused planning permission by the Council, and will now go to a public inquiry following an appeal by Bellway Homes. Stonehenge Visitors Centre. 2011. Complaint lodged with European Commission on behalf of the Stonehenge Alliance (comprising FoE, CPRE, Campaign for Better Transport, ASLAN, Rescue and the Pagan Federation) for non-compliance with European Habitats Directive. Communities Before Developers 2011. Advice on Local Development Framework (LDF) and planning matters for East Devon District-wide community group. For more information, see Communities Before Developers 2011. Hereford Relief Road 2010. Advice for local residents on proposed relief road for the City of Hereford involving potential impacts on the River Wye and River Lugg Special Areas of Conservation (SACs). Ashton Vale, Bristol. Football stadium and superstore development scheme. 2010. Solstice Park Retail Distribution Centre, Salisbury Wilts. 2009-10. Seaton, Devon. Tesco superstore and urban regeneration scheme 2009-10. Haddenham, Bucks. Stud farm development 2010. Whitsand Bay, Devon. Marine dumping. 2010. Criggan Mill, Cornwall. Holiday Development in Area of Outstanding Natural Beauty. 2010. Archery Ground, Hastings. Urban Redevelopment scheme. 2010. Eastney, Portsmouth. Housing development on former MOD land. 2008-10. Photo: Legal challenges can make a long-term difference. "R v Carrick District Council ex parte Shelley" was part of a long-running campaign to make water companies dispose of sewage more responsibly, making beaches and bathing waters cleaner and safer. R (on the application of Corbett) v Cornwall County Council CO/7605/2012. Judicial review of grant of planning permission for windfarm in Area of Great Landscape Value. R (on the application of Save Our Parkland) v East Devon District Council CO/5494/2012. Judicial review of grant of planning permission for up to 400 homes on greenfield site. Smyth v Secretary of State for Communities and Local Government CO/8108/2012. Statutory Challenge to grant of planning permission for housing on a site adjoining a Special Area of Conservation (SCA) and a Special Protection Area (SPA). Statutory challenge to grant of planning permission for Energy from Waste (EfW) plant adjoining European SAC. Judicial Review of grant of planning permission to construct Energy from Waste (EfW) at Devonport. R v Darlington Borough Council (on the application of Bence) CO/5970/2008. Cornwall Waste Forum v Secretary of State for Communities and Local Government Court of Appeal EWCA  Civ 379. Cornwall Waste Forum (CWF) v Secretary of State for Communities and Local Government. High Court CO/6088/2011. I advised a group of Cornish environmental organisations opposed to the construction of an energy from waste incinerator at St Dennis. Working in conjunction with a London firm of solicitors, we successfully overturned the Secretary of State's decision to grant planning permission for the scheme following a lengthy public inquiry. The case focused on the correct application of the Habitats Regulations and Appropriate Assessment. Read a summary of the case and the judgement [PDF files]. Davies v Secretary of State for Communities and Local Government CO/2738/2008. R v Bournemouth Borough Council (on the application of Harrington) CO/1664/2007. R v Secretary of State for Communities and Local Government (on the application of Hatt) CO/8359/2006. Falmer Parish Council & Lewes District Council v First Secretary of State CO/10122/2005. R v Wigan Metropolitan Borough Council (on the application of Hampson) CO/1049/2005. The Alliance Spring Co. Ltd & others v First Secretary of State CO/3432/2004. R v London Borough of Islington (on the application of Bedford & Clare) CO/0529/2002. R v Dorset County Council (on the application of PPG11) CO/1084/2002. R v Secretary of State for Transport (on the application of Bown) CO/2776/2002. R v Cornwall County Council ex parte Gwennap Parish Council CO/168/2002. Ecogen Developments Ltd v Secretary of State for Trade and Industry CO/2144/2001. R v Cornwall County Council ex parte Hardy & Gwennap Parish Council CO/4784/99. Case study. R v Ministry of Agriculture Fisheries and Food Ex parte Friends of the Earth Ltd and Others: 1999. R v Secretary of State for the Environment ex parte Watson, Court of Appeal 21 July 1998. Case study. R v Carrick District Council ex parte Shelley CO/3484/1995. Case study.